The god of thunder has a movie coming out next week, which of course means that Marvel is going to be launching a new Thor series, with a new number one. Mighty Thor acts pretty much as a continuation of Matt Fraction’s previous run on Thor, which doesn’t strike me as making this issue as new-reader friendly as Marvel would like. The issue begins with some pretty stellar scenes with The Silver Surfer and Galactus, with the customary dialogue that has become a staple of any appearance by the Surfer. As a fan of the guy, anytime I get to see him in a book I’m happy, and I’m curious to see how his and Galactus’ inclusion here plays out in future issues. We then change places to a Broxton, Oklahoma church, in which the local pastor is giving a pretty interesting sermon regarding man’s place in a world filled with gods and super-powered beings. I found these parts of the book to be very interesting, and I actually wish they lasted a little longer. After this, we then switch to Asgard, where much of the issue takes place. Picking up from Matt Fraction’s previous story, Thor and Sif must travel to the root of the world tree and pluck out its seed for Odin. This proves to be easier said than done, as the tree uses “anti-body” type creatures to help battle intruders. As Thor and Sif become overwhelmed by the world tree creature, Loki (still in child-size) arrives to assist his brother, which allows him to retrieve the seed. Matt Fraction dialogue is killer here, ably shifting from introspective (for the scenes with The Surfer and the pastor) to witty and charming (Thor’s reactions to Sif and the creature, Loki). However, I wish there was more of a reason for why the Surfer is bookending this issue, and being featured on the cover. The art by Oliver Coipel is phenomenal though. His layouts are breathtaking. While it may not appeal to newbies who are walking out of the cineplex, Thor followers will get a kick out of this issue. Now THIS is an Avengers book! Brians Bendis and Hitch deliver the latest “.1” issue, and it’s a doozy. 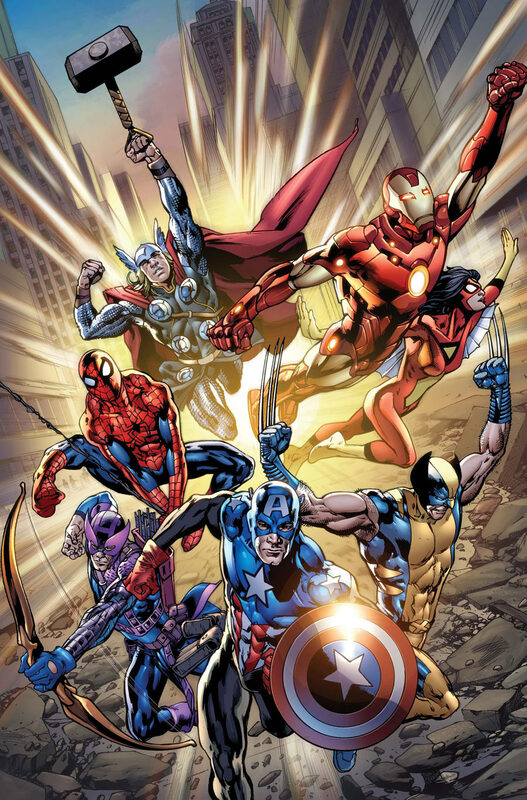 Steve Rodgers sends out a search and rescue team to find Spider-woman after she goes missing on an assignment for S.W.O.R.D., and what they find is a whole new threat that has given birth to the return of an old enemy, who makes all of Earth’s Mightiest Heroes tremble. Bryan Hitch’s art here is fantastic, and a HUGE step up from John Romita, Jr.’s rush jobs of late. I had been considering dropping Avengers after the last storyline, but not now. I’m fully on board for this, and can’t wait to see the reveal here pay off down the road. War of the Comic Reviews! This week we’ll be looking at the latest installments of the ongoing “War of the Green Lanterns” story arc that has been running through Green Lantern, Green Lantern Corps, and Emerald Warriors. Where we last left the Corps, the fallen guardian Krona has taken control of the central power battery by re-inserting the creature Parallax, allowing him to control all of the Green Lantern members. 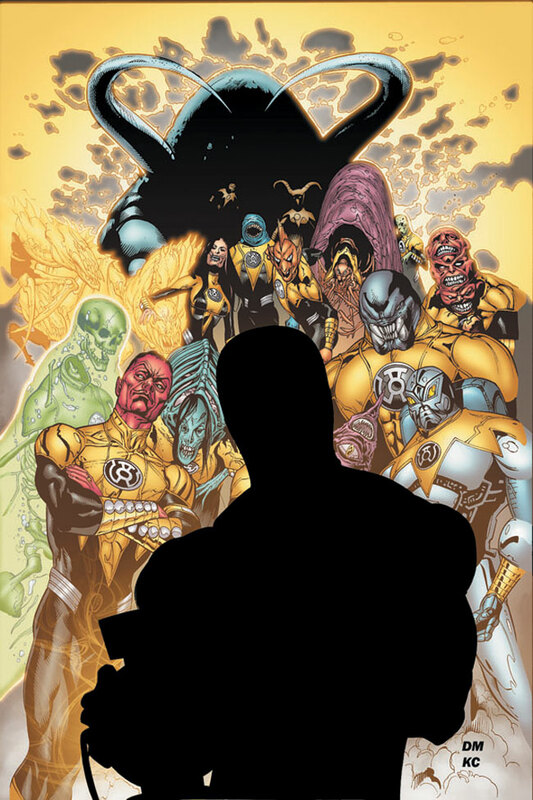 The only members unaffected by this are Kilowog, Guy Gardner, John Stewart, Ganthet, and of course, Hal Jordan. The reason for their immunity is due to the fact that they were all once possessed by Parallax. When we last left these members, Kilowog was captured, John and Kyle removed their rings so they couldn’t be tracked, and Hal and Guy had it out on the planet known as “The Green House”. The fourth part of the story focuses more on Hal and Guy (fitting since this is Hal’s book), on the “Green House” planet, which looks more like Hoth and less like a Wal Mart outdoor nursery. As always, Geof Johns has a great handle on the dialogue, especially when he lets slip some Empire Strikes Back jokes about the planet. The plot moves pretty briskly, setting up the status of Kilowog’s fate, as well giving us a glimpse into the whereabouts of Ganthet(hint, it’s not good for the little guy). Guy and Hal quickly find the jet that Hal built for these kinds of emergencies, and find their way to John and Kyle, where Hal presents them with a choice that will certainly shock readers (if they didn’t pay attention to either of the issue’s covers). Green Lantern Corps picks right up from the end of Green Lantern, and finds our “former” Green Lanterns defending Ganthet from an assault from the brainwashed GL’s, while at the same time trying to control (and understand) their new powers. Tony Bedard’s script, while not as good as Johns’, still keeps the action going, albeit while focusing on member John Stewart. The “new lanterns” ably try to defend their true guardian, but things get a little trying when Mogo, the effing PLANET Green Lantern, shows up, and guess what? He’s also under Kronos’ control. The art is handled by Doug Mahnke in Green Lantern, and Tyler Kirkham in Corps. I’ve always been a big fan of Mahnke’s style, and there is no difference here at all. Kirkham’s art however, has a more cartoony look thank Mahnke’s, and it makes the transition a little jarring. However, I do commend DC for letting the different creative teams of the books handle the individual chapters instead of just having Johns and Mahnke take over Corps and Emerald Warriors for the story arc. While “War of the Green Lanterns” is no “Sinestro Corps War”, it’s definitely the shot in the arm the series needed after the rather lackluster “Brightest Day” tie-in storyline, and one of the finest storylines going in comics right now. If you are looking for action, these should be the first things you pick up. 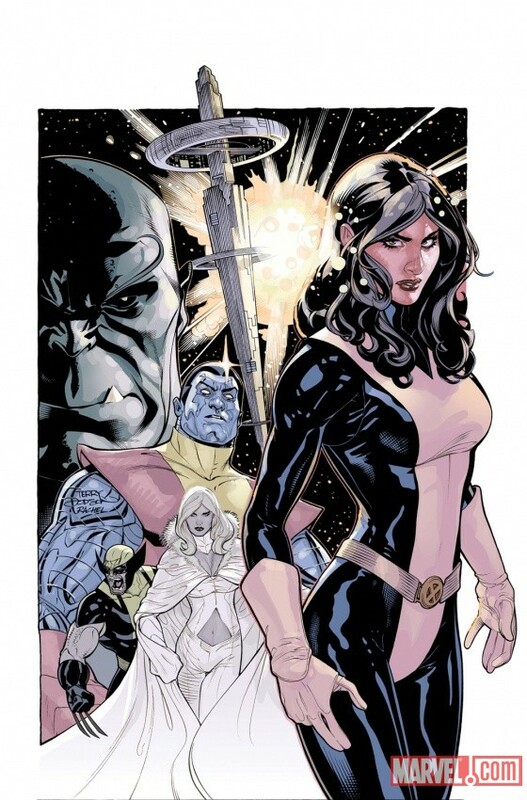 Well, apparently I’m not immune to the Marvel “.1” initiative, as I’m now picking up the newest issue of Uncanny X-Men after picking up last week’s 534.1, in which a PR team is sent in to work on Magneto’s image before the public finds out about the former villain being a member of the team. This issue, the second written only by Keiron Gillen, is in many ways a sequel to Joss Whedon and John Cassady’s Astonishing X-Men run, where the X-Men traveled to Breakworld and did battle with their evil race. This issue serves as a nice introduction to the story, and sums up the previous journey Breakworld for those unfamiliar with it. The opening of the issue is very well done, with Colossus and Kitty Pride sharing a “romantic” lunch, despite the fact that Kitty has been trapped in her intangible form since she was brought back to Earth in a giant bullet (yes, you read that right). The X-Men have been holding onto said bullet, and Magneto is getting antsy because he can’t figure out why he cannot control it. Conveniently the head of S.W.O.R.D. shows up and requests the aid of the X-Men, as Colossus defeating the Breakworld leader has caused a vaccuum in power on the planet. Terry and Rachel Dodson handle the art issues on the book, and since their work is some of my favorites, it factored heavily into my decision to pick this issue up. The characters look great, and I particularly like their version of Magneto. Gillen and the Dodsons have finally given me a reason to pick up Uncanny X-Men again, and my hope is that this issue is the start of something good. Wait, what happened in the previous issue of Carnage? Making this miniseries a bi-monthly title is killing it. Oh that’s right, Cletus Kasady was revealed to be alive and well. The penultimate issue of the return of Carnage reveals how Cletus survived being ripped into shreds by The Sentry, and it’s a pretty cool revelation. Essentially the symbiote allows his lungs to use carbon dioxide to breathe, which in turn allows the symbiote to survive. Unfortunately, Carnage’s dialogue in this issue is pretty terrible. Maybe it’s Zeb Wells’ script, but the “quips” that Carnage makes while attacking Iron Man and Spidey are some of the worst I’ve ever read. Bad jokes and quips aside, this issue offers some pretty cool revelations regarding Carnage, and the armored guards who showed up in the previous issues. The company that employs them was also the same company that recovered Carnage when he returned to Earth. Of course, being greedy scientists, they decided that the smart thing to do would be to harness parts of the symbiote to power their armored suit technology. Of course Carnage can realize this, and proceeds to rip them apart. We also get more of Shriek and Doppelganger Spider, as well as a revelation regarding a certain “bundle of joy” on the way. Although I’m pretty sure the already forgotten Toxin fulfills that character slot in relation to Carnage. 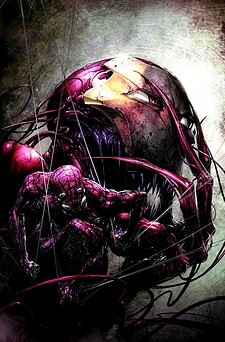 The art by Clayton Crain is great at first, but once Carnage absorbed himself into one of the other guards it became very messy and hard to follow. Despite this, there are some great action scenes, like when Iron Man drops the truck on Carnage, are great, and if you’ve already picked up the previous three issues, there’s not point in stopping now. Even if you may need a few minutes to remember what happened when issue 5 comes out. 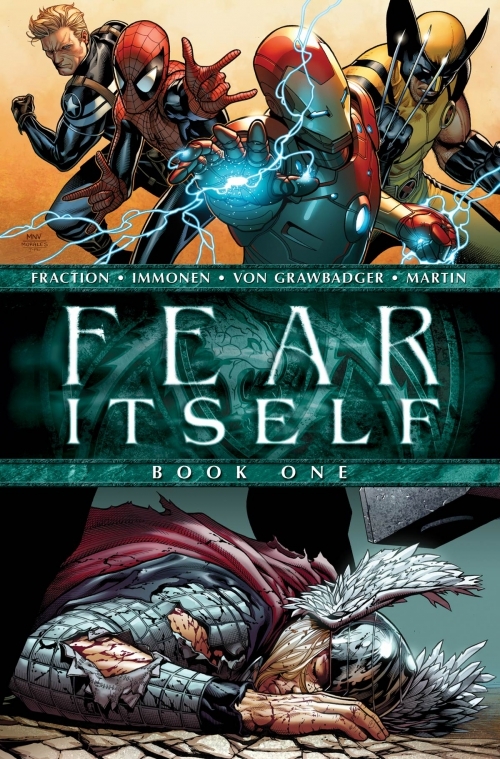 And so begins the latest Marvel mega-event Fear Itself. This first issue feels less like the openings of a company wide event and more like a Thor and Captain America crossover. However, it’s still pretty sweet, and sets the stage for some pretty exciting things to come. The issue begins with Steve Rodgers and Sharon Carter attempting to quell a riot between citizens who are rioting over a certain hot button topic regarding a religious building being assembled in New York City. At the same time Sin, the daughter of the Red Skull, finds the mystical hammer she has been searching for. After she picks it up, she is given the power of the hammer and becomes Skadi. As she plummets deep into the ocean, she uncovers the mysterious “true” All-Father, who was hidden and banished by Odin many years ago. At the same time, Tony Stark announces that he will be rebuilding Asgard, and employing people from Broxton, Oklahoma and the surrounding towns. His hope is that his will help kick start the economy a little bit, and help quell some of the fears that many of the town’s citizens have. 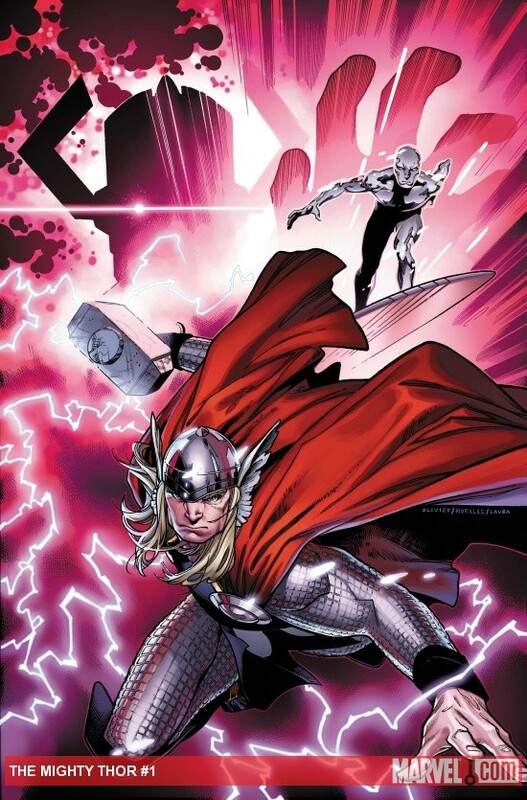 The issue ends with the “All-Father” sending to Earth a series of weapons for those he deem “The Worthy”, and Odin demanding that all Asgardians leave Earth immediately, after beating down his son Thor. The script by Matt Fraction blends the real-world events with the fantastical Asgardian ones pretty well, but as I said before, this doesn’t really feel like a big, universe changing events just yet. Granted this is the start up issue, and the nuggets of potential are all here. The art by Stuart Immonen is fantastic, and helps to create a cohesion between the fantastical and the practical. I’m definitely going to be following the story, but I hope the next installment explores the effects this will have on the Marvel universe outside of just Captain America and Thor. I’ll be completely honest, I had no idea what Nonplayer was until my boss at Jetpack Comics started tweeting about it the other day. After checking out some preview pages online, I was sold just on the art alone. 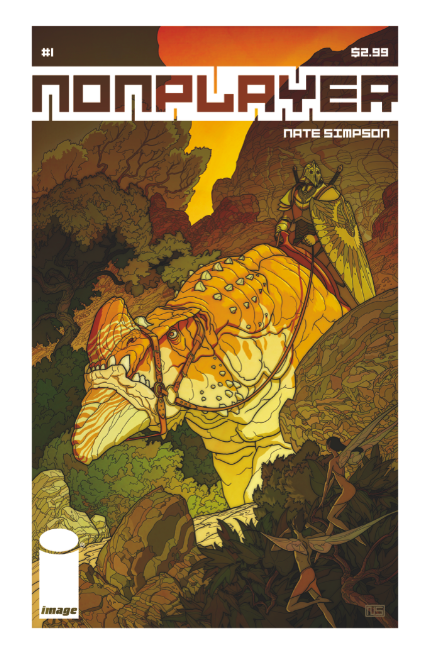 Nate Simpson’s art is fantastic. The world he has created in just one issue has blown my mind, and while the story may make a lot of people think of The Guild (in fact, I had a hard time not picturing Felicia Day as the main character), the story is still pretty cool, and the art alone makes this a worthy purchase. The story of Nonplayer so far involves a girl who plays a futuristic video game, in which it is obvious that she is much more comfortable there than in real life. This World Of Warcraft/Jurassic Park world is an amazing sight to behold. Everything about the art in this book pops off the screen, and the fluidity between the panels is some of the best I’ve seen in the past few years. While I wasn’t fully of aware of Nate Simpson before, I’ll most definitely seek out work he’s done in the past. This is a world that I would love to see more of, and I’ll be picking up the next issue. At only $2.99, this issue is worth it if you’re curious, and if you didn’t get it before, the art alone is worth the price.